Live, Laugh, Blog: Children's Book Giveaway! This has got to be one of the cutest children's books I've ever seen. "I Can Drive!" 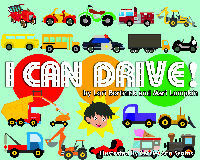 by Lori Bortnick and Mari Lumpkin is about Brando and his love of things with wheels. The illustrations (by Carriel Ann Santos) are adorable!